They spread silently through the garden with little to show but their inconspicuous grassy leaves, eventually making their way into the lawn and remaining invisible to all but the most astute observers. But then comes spring's first drenching rain, and something magical happens. Roadsides, gardens and lawns alike burst into blooms of white, yellow and pink like rays of sunlight on a snowy day. The rain lilies are blooming and suddenly you realize that you're smiling. 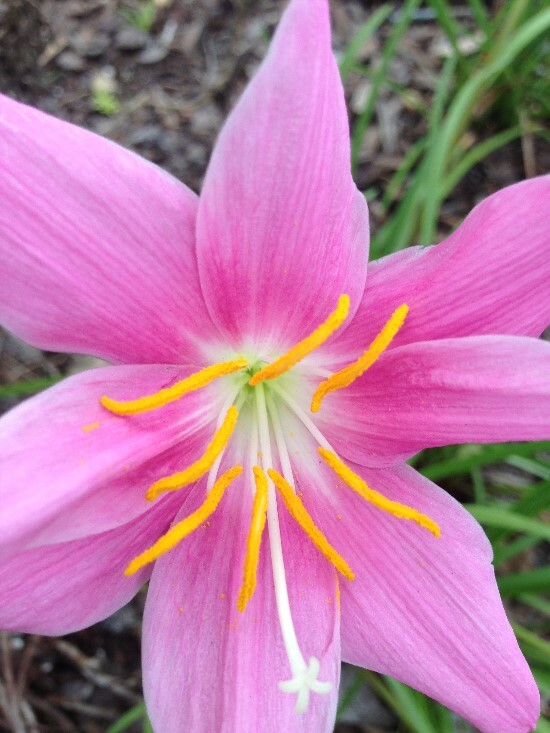 In a Southern garden, rain lilies are like the icing on a red velvet cake or the spanish moss on a grand old live oak. I've heard so many Florida gardeners complain about our lack of daffodils, tulips and crocuses, but clearly they've never seen a patch of rain lilies in bloom. And here's what makes them better than traditional spring-flowering bulbs: While tulips and hyacinths are a one-trick pony with only one flush of flowers in spring, many rain lilies bloom repeatedly from spring to fall following each drenching rain. Some bloom primarily in spring and others in summer or fall - but whenever they choose to open up, it's hard not to smile. When planted in the garden, most will bloom within the first year and multiply until your landscape is filled with magic. Despite their many charms, you have to wonder why rain lilies (Zephyranthes and Habranthus) are still somewhat absent from the suburban landscape. It could have to do with the fact that they aren't much to look at when out of bloom, making them a poor candidate for the demanding sales floor of a big garden center. But I think that in order to 'get' rain lilies, you have to be an optimist who can visualize their beauty in the future. 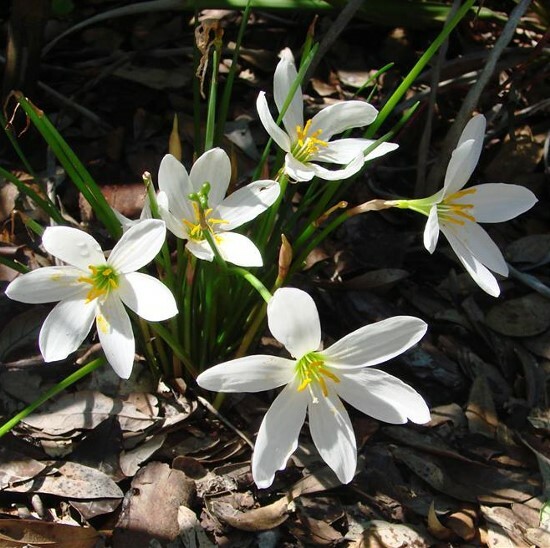 In Passalong Plants, Felder Rushing reminisces about pilfering rain lily bulbs from an abandoned property and getting away with it thanks to their lackluster wispy dormant foliage. I'm not sure that the authorities really care about the dormancy of the plants you're digging when they're giving you a shiny new pair of handcuffs for trespassing, so I would recommend seeking permission if you plan on any collecting trips of your own. 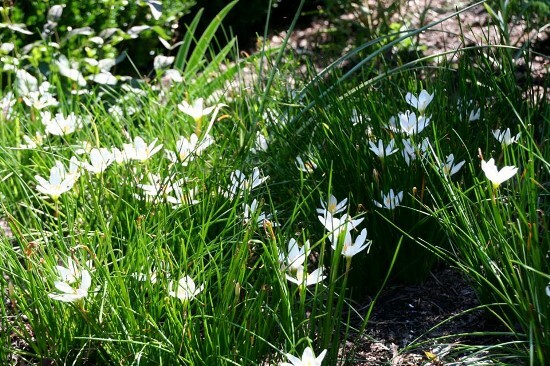 Even in season, rain lilies are always much more spectacular in the shadow of more impressive plants and peppered between groundcovers or perennials. The plants that I purchased myself were either dry bulbs or pots of floppy skinny leaves, like a bad combover of stringy hair on an ugly bald patch of soil. But maybe it's for the best that rain lilies remain invisible as passalongs, spreading as bulbs passed between friends and exhumed from old estates like cookies from a cookie jar. It's more fun that way, and since the human element is so essential to their existence, they tell so many more stories that way. This one almost always has eight tepals, meaning four petals and four sepals. You might remember how I planted pink rain lilies in memory of my mother, but here's how the story began. I had found some three-gallon pots of scraggly leaves at a local nursery, and bought them immediately when I saw that they were labeled as 'yellow rain lily' and 'pink rain lily' so that I could plant them right by my mother's doorstep when her health had started to deteriorate. I wanted to remind her that all of those storms served a purpose, and to surprise her with cheery blooms when they were least expected. I'm not sure that my cheerful mom needed such reminders. They always seemed to bloom on the days I wasn't there, and the normally bulletproof yellow rain lilies died before I ever got to see their flowers. 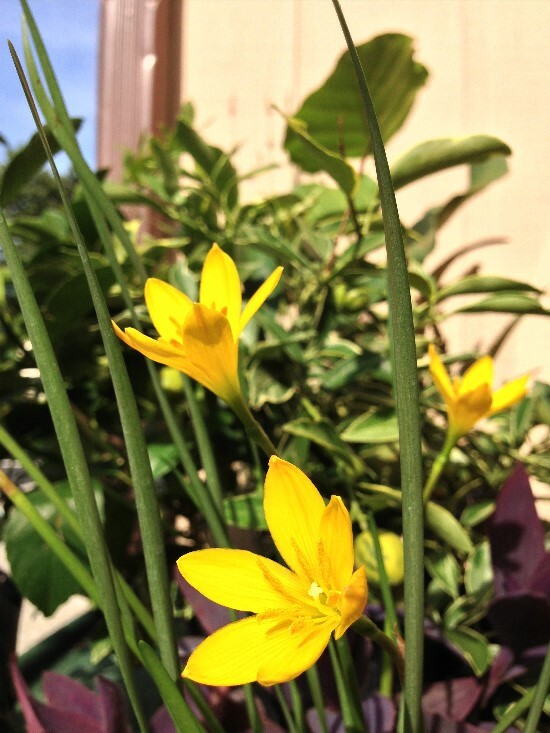 Last month I found the same scraggly looking yellow rain lilies in a three-gallon pot at the same garden center, and they were likely from the same shipment as my mother's ill-fated plant; too untidy and sparse to be of much notice. I forgot about them entirely until one day they bloomed, filling me with so much joy that the neighbors might have heard "Oh wow! Oh wow! So... beautiful! "from their beds. 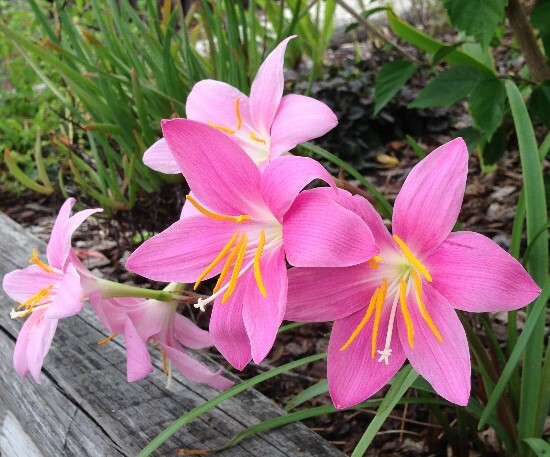 Whenever my pink rain lilies bloomed, I thought of them as a smile down from heaven. When the yellow ones bloomed, it was like meeting an old friend that I thought would never return. It isn't difficult to see how one can attach a deep emotional or spiritual significance to these humble messengers of the garden, and it seems that everyone has a tale to tell. 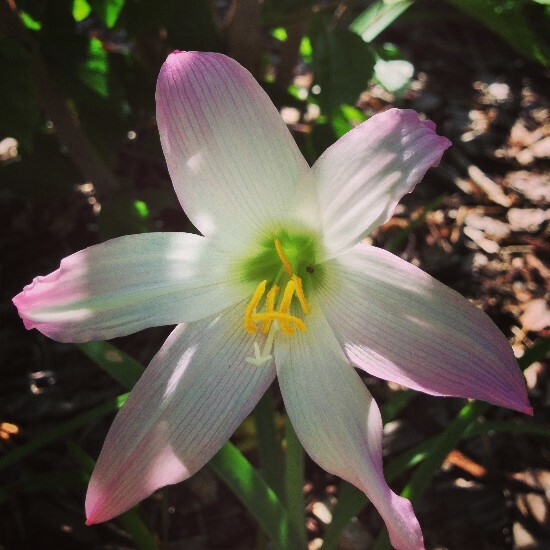 For example, a good friend of mine has fond memories of playing in a field of atamasco lilies as a little girl, and I get to watch that very same field bloom every spring. My friend Teresa Watkins planted them in her landscape design for severely wounded warriors so that they'll spring up as a wonderful surprise. These plants are ideal as humble and unassuming gifts that keep on giving. 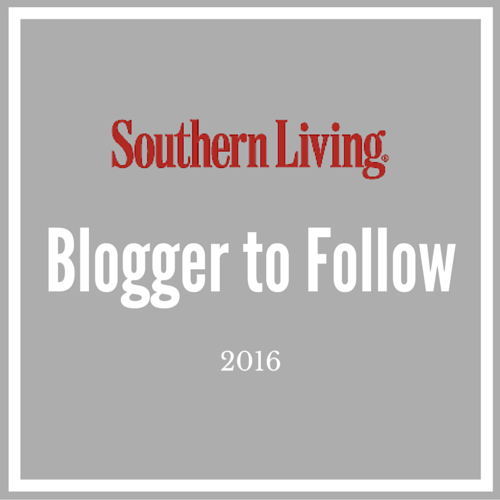 Helen Yoest first became interested in them when she learned of the Southern Garden History Society's ceremony to honor Elizabeth Lawrence, the first female landscape architect on North Carolina. Helen recalls: "Members made a pilgrimage to Lawrence's unadorned grave in a colonial churchyard outside Annapolis where they planted white rain lilies donated by Old House Gardens - Heirloom Bulbs." According to the aforementioned book Passalong Plants, I read that Elizabeth was also largely responsible for the task of sorting out the names and backgrounds of rain lilies for us, which was no small task considering I still have a hard time telling some apart. (At least the Pacific Bulb Society has some helpful guides to Zephyranthes and Habranthus) Having learned that, the society's loving gesture became even more meaningful. Helen herself now has hundreds of rain lilies such as the ones pictured above growing in her own garden. 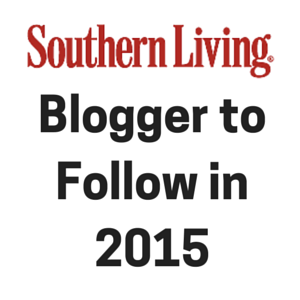 Crinum specialist and garden designer Jenks Farmer has his own stories. He has fond memories of native atamasco lilies (Z. atamasco) blooming in lawns and amongst palmettos in the woods, but has better luck with more robust species in the garden. "Whenever I make a new garden for someone, I always end with pushing a few Z. (grandiflora) bulbs into the ground; they'll flower four or five days later and charm the pants off the owners --- about the same time the bill is arriving in the mail." Pantsless people, rain lilies and getting paid... what could be better? I'm sure I'll make a lot of people angry with this statement, but here goes. There are a lot of black-and-white views about how we should replace the exotic plants in our gardens with natives, but I feel that the bulbs and heirloom perennials planted decades and centuries ago constitute a gray area in the debate. I'm all for planting as many natives as possible, but how could we possibly deny the value of these historical treasures and the stories that they tell to our distracted generation? Those old and forgotten plants sitting on rural homesteads and historic neighborhoods are every bit as American as you - descended from the hopeful immigrants that built our nation. We can't go back to the way things were before our great-grandparents set our existence and our sprawl in motion, so why not treasure the plants that they grew as if they were a living representation of our past? 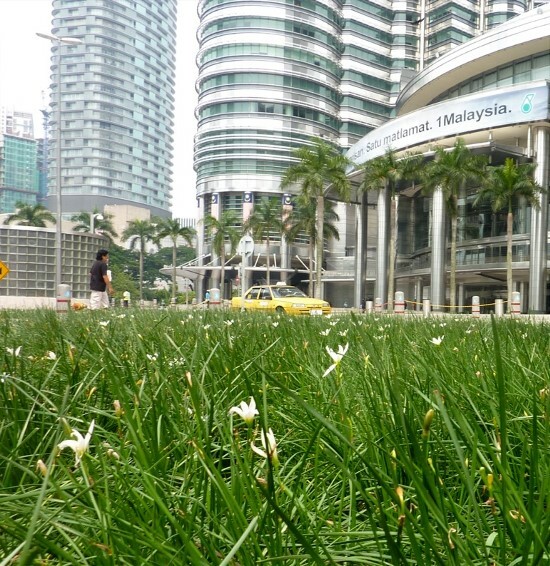 If that old milk and wine lily has made it this far without destroying the ecosystem, then we shouldn't credit it and other non-invasive plants for the strip malls and suburbs that have transformed our landscape. Old passalong plants deserve a spot in our garden if only for surviving as long as they have - all while disrupting the ecosystem less in their lifetimes than we humans do in a single day. Rain lilies look beautiful even as they fade. It's human interest that draws me to rain lilies the most, but they also have tremendous spring, summer and fall interest in the garden. Rain lilies are at their best when planted along with mondo grass, lilyturf, daylilies and other fine strappy-leaved plants where they can blend into obscurity until just the right time. Actually, they work just about anywhere; in the lawn, amongst other perennials or at the base of trees. Most are only hardy into zone 7, but Jo Ellen Meyers Sharp and many other unfortunate northerners still grow them in containers without much trouble. 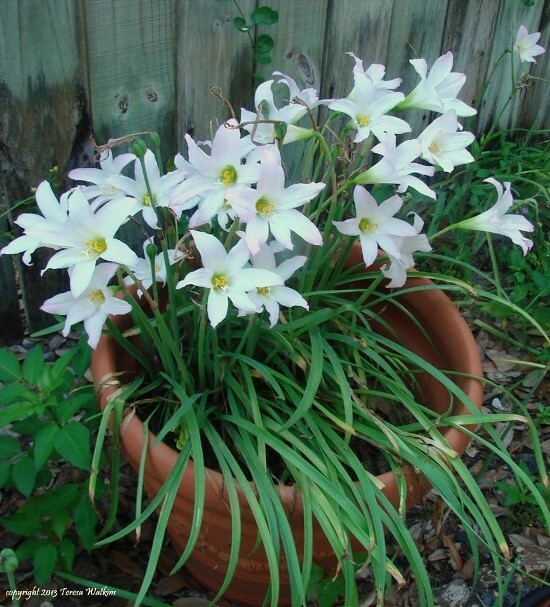 Rain lilies in in a container, courtesy of Teresa Watkins. If you can't find an abandoned homesite, roadside or neighbor's lawn bedazzled with these little charmers, purchase bulbs from Plant Delights and Bulbs and More to start your own collection. Better yet, ask a gardening friend online for some seeds or bulbs so that you have your own story to tell. 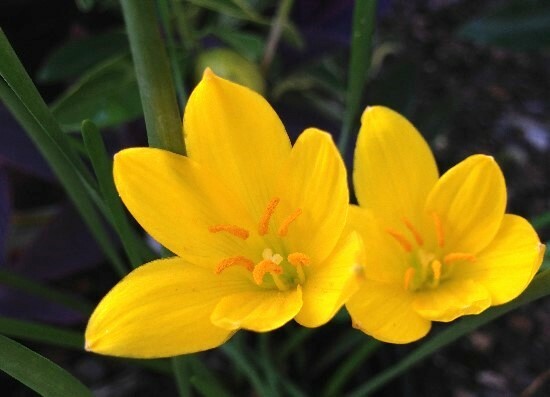 I have some yellow rain lily seeds to give to the first person to ask for them in the comments, as a matter of fact. Many start readily from seeds, as evidenced by the pink rain lily seeds given by a friend that grew to blooming size in just two years. 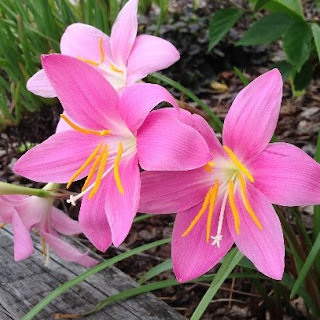 Pink rain lilies change color throughout the course of a day. The two photos above are from the same plant. "Just because they aren't sold by the kazillions, they're unfairly lumped into the category of 'minor bulbs'... Each unexpected flower brings a smile. And there's nothing minor about that." 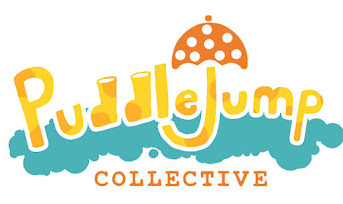 Plant something that's not native? Are you quite mad???? Next thing, you're gonna tell us it's OK to plant camellias, bananas, tomatoes, citrus, and other invasive exotics! Shame on you, Mr. Asbell! Beautiful post, Steve! I planted a sedge lawn interspersed with rain lilies for a client a couple of years ago — the foliage blends in with the sedge until they burst into bloom after a good rain (which is, like, twice a year here). I imagine them doing jazz hands when you come out and see them in the morning, like "Here I am! Woooo--aren't I gorgeous??" And -- I am with you on the native plant issue. I live in an area of Texas that has been experiencing some severe drought for several years now, so natives are a natural and smart way to garden. But I will NEVER give up or turn my back on some heirloom or other ornamental plants that give such pleasure. Why do we garden if not for some amount of pleasure? I love the jazz hands visual! 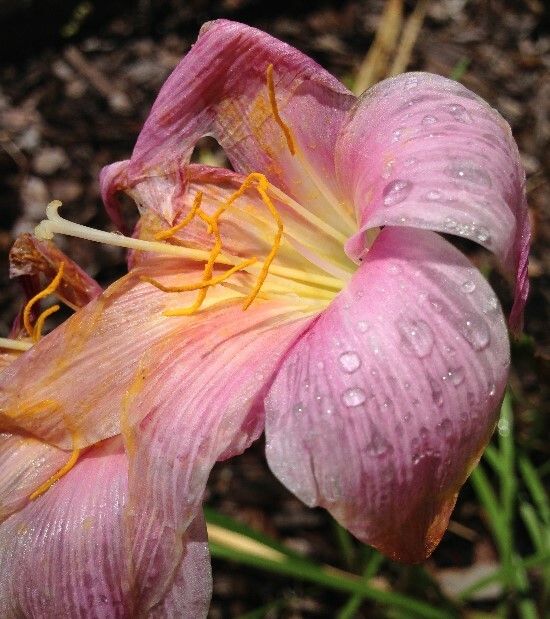 Gardening should be done for the sheer joy of it, and rain lilies are some of the happiest plants around. Incidentally, Florida natives like sea grape, wild coffee and coral bean have also been known to brighten my day... hey I know! They can all make me happy together! I planted rain lillies years ago in my zone 8 garden. One came up, bloomed once and was never seen again. If you would like to share the wealth, I would love to try again. Send me an email to steve_asbell@yahoo.com and I'll be happy to pass along some seeds! Thanks for sharing your story and photos, Helen! I have a container of pink rain lilies that I've had for five years or more. I'm one of the unfortunate ones that can't plant them in the ground and leave them there, but I sure enjoy them in the container, all the same. And I agree - we garden for the enjoyment of it, not just for the environment, although we do that, too. I'm not THAT altruistic of a person to only garden for others' enjoyment or benefit, be they human or some other creature. If you're growing rain lilies, how could you be unfortunate? Anyways, I garden for myself most of the time, but knowing plants are enjoyed by others sure is a nice little bonus. very nice flowers you have there! tnx for brightening my day. winter is coming :( depressing days are back. Steve, Thank you for helping this homesick soul fall in love with plants again. 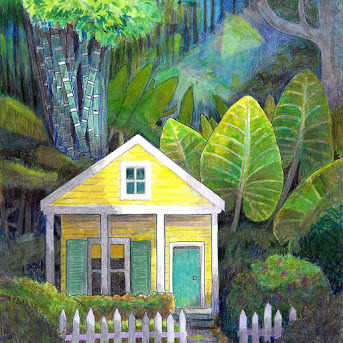 I recently moved to the urban jungle of Florida from the lush and diverse mountains of North Carolina. These flowers remind me of the delightful surprises found along miles of wilderness trail, something lacking amidst condos, asphalt and sand. I've been scouring the internet for ideas on how to make my corner of the world a little more homey, and you came through! 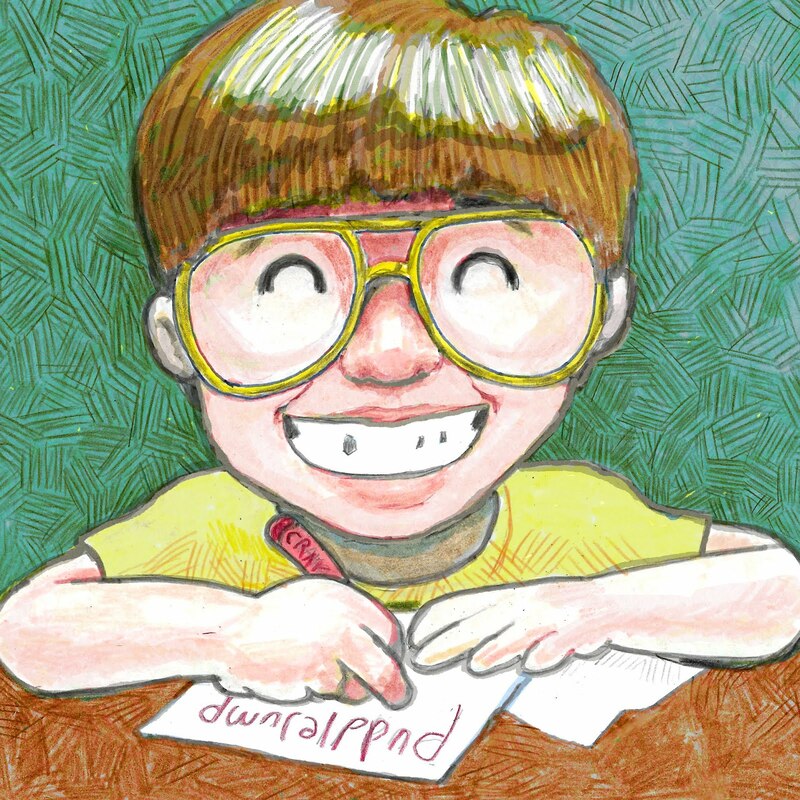 Please continue writing and inspiring the rest of us! Steve, What a wonderful article. These rain lillies are a beautiful breath of spring for the home. I am new to gardening in Central Florida as I am a west coaster in the NW. If you still have any of the seeds, I would love to try my luck with these beauties. My new garden needs lots of TLC and it is time to get to work. Thanks.